West Midlands. “Internal” kilns in converted buildings and barns. The countryside and soil of Hereford and Worcestershire was well suited to hops with a good supply of poles and, according to Defoe in 174 “a diligent people ..addicted to husbandry who boast they have the finest wool, the best hops and richest cyder in Britain”. Hopped beer had to compete with the local taste for cider and it is likely that from early on a high proportion of the dried hops were sent to market and brewers in the Midlands. The region is rich in half timbered buildings of the 16-18thC. like the Weald of Kent and Sussex. 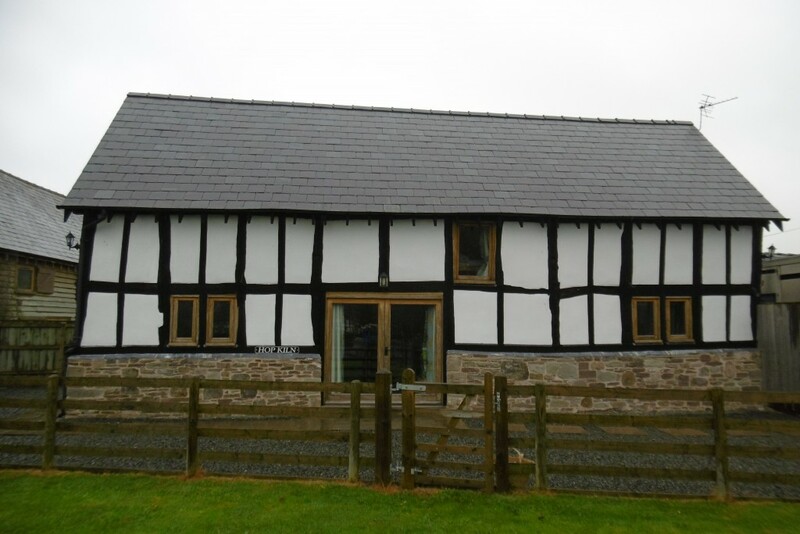 The style is distinctive and easily recognisable, commonly with a square pattern of timbers in the wall, the panels between filled in with wattle (lath, thin strips of wood) and daub (plaster). Simple rectangular buildings served as dwellings or farm buildings. Further west towards the hills stone farm buildings become more widespread. A barn style hop kiln. Upper Elmores End, Whitbourne. Photo Jennifer Weale, Bromyard History Society. Dr Edward Peters has identified more than 100 buildings from the 17th-18th Centuries that contain evidence of former use for hop drying. In some cases the only remaining evidence is a hop pocket round hole in the floor. Drying floors were square or rectangular, ranging from a single kiln to a group of 4 kilns. Kilns were generally 7 to 10 foot square, as in Kent/Sussex. 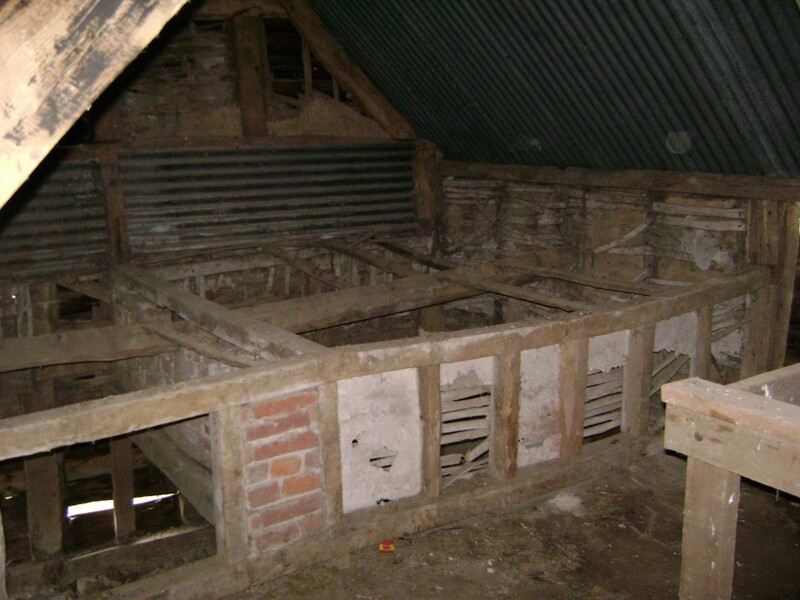 Some had the plenum (furnace) area below the drying floor enclosed, as at Golford in Kent, with a cone of brick or lath and plaster. 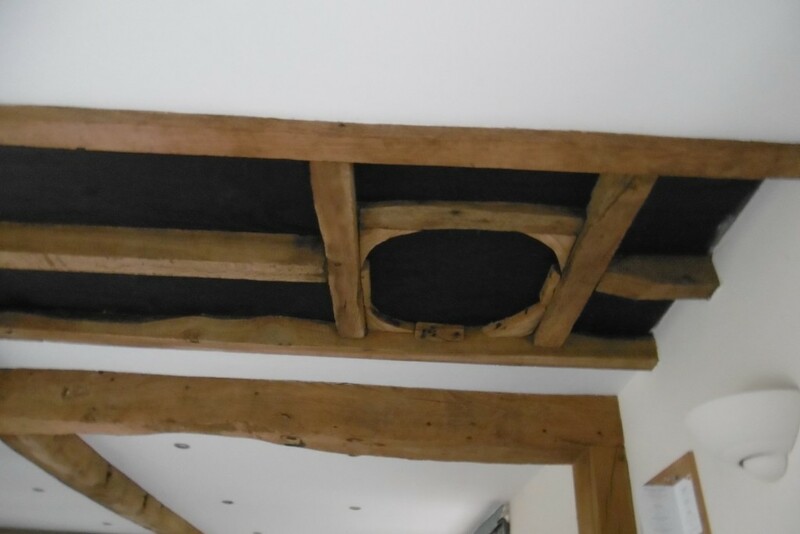 But in most cases the detailed interior fittings have not survived and the evidence of former drying floors is from timber structure and joints. 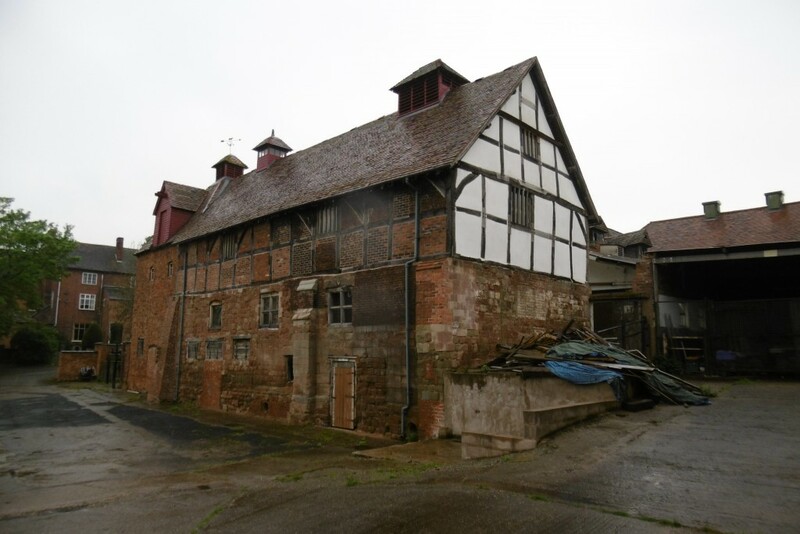 One example of a West Midlands 17th-18th C structure with internal kiln stands amongst the fine collection of half timbered farm buildings at Luntley, west of Leominster. 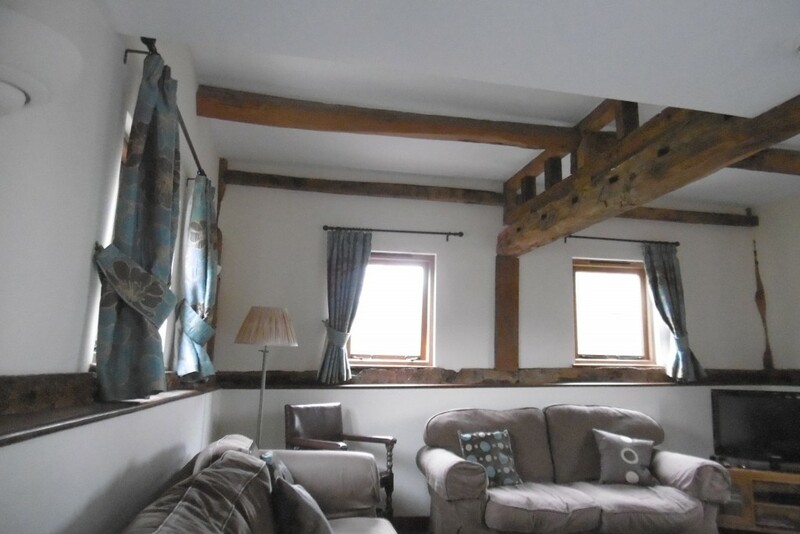 The hop kiln (now holiday rental accommodation) has been converted sensitively by local architects McCartneys of Ludlow They have preserved the beams with joints for the cross struts of the drying floor,and the bagging hole. Luntley. Looking from what was the stowage into the kiln area, showing the lone of holes which held the struts of the drying floor, and the change of height from the cooling floor to the drying floor. 1990s photo taken by McCartneys of Ludlow before conversion showing the low brick/lathe and plaster walls around the two small kilns to retain the hops during drying. On the South East fringes of Worcester on the edge of the water meadows where the River Teme meets the Severn is an unusual hop kiln at Manor Farm, now used for general storage. 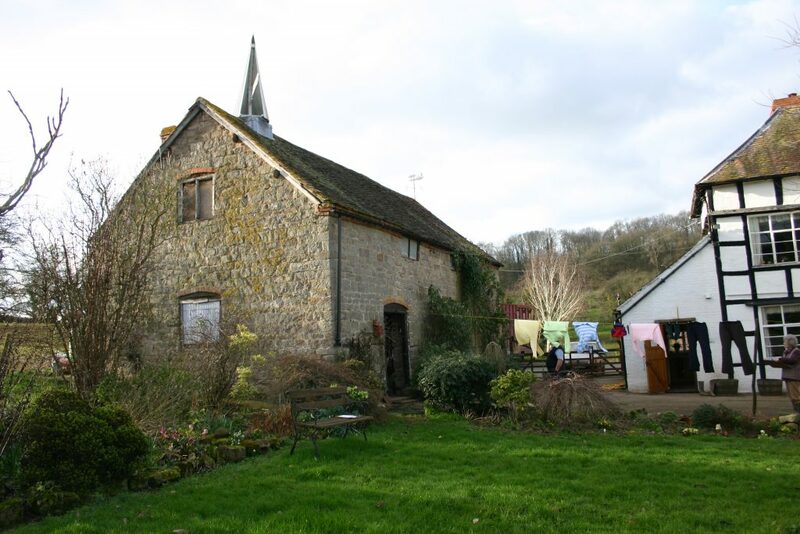 The building is a melange of materials explained by the fact that in the 19th Century 7 kilns were built beside and inside the walls of a 12th Century church. Remnants of 3 of the kilns survive plus a hoist up to the second floor. Hop drying operations ceased there in the 1920s.